I’ve been meaning to print letterpress cards for different occasions and finally got around to printing birthday cards. I wanted to create something, I felt, was timeless. My only dilemma when it came down to the letterpress printing was which color to print these in. Originally, I was planning on printing them in a light pink color (since pink is one of my favorite colors), however, I already had black ink on the C&P so I figured, let’s see how it looks in classic black. I printed a few on the Pearl White cardstock and thought it had a vintage feel to it, which of course, I absolutely loved. I had some extra Fluorescent White cards and decided to print on those, too. The contrast of the black ink on the bright white paper just looked too good to resist. I ended up printing a bunch of them on both the Pearl White and Fluorescent White cards. I’ll probably end up printing a few more in light pink…or even lavender…or both! So many choices! 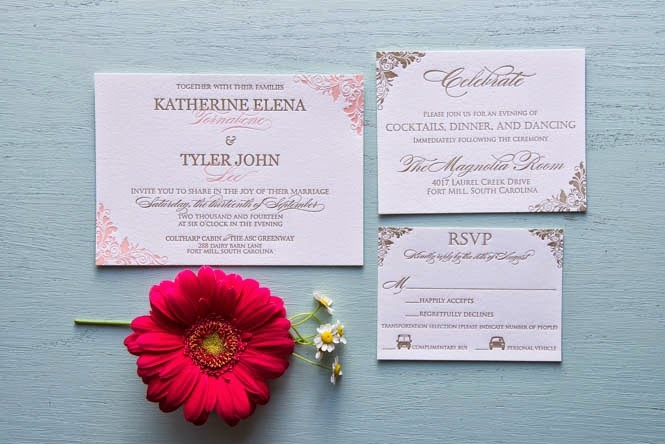 For more photos of our letterpress cards, please be sure to check us out on Facebook! I am currently working with Nicole on her Letterpress Invitations for her upcoming wedding in September, but I wanted to showcase her letterpress Save the Dates we printed for her a few months ago. 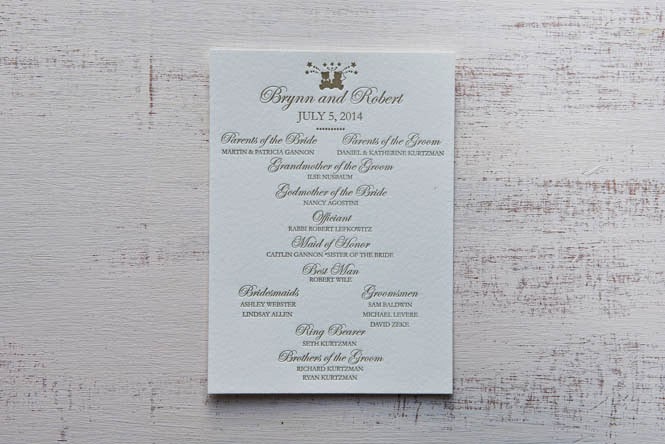 She initially contacted me at the end of 2013 for her letterpress cards and I’m so glad we were able to do the letterpress printing for her and her fiance. 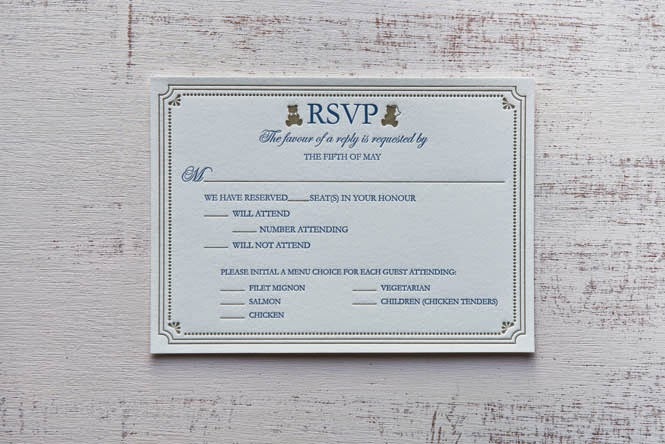 I’m honored she wanted to get the rest of her letterpress invitation suite printed through us and I’m having a ton of fun designing it so far. The letterpress printing was done on our C&P (yet again). 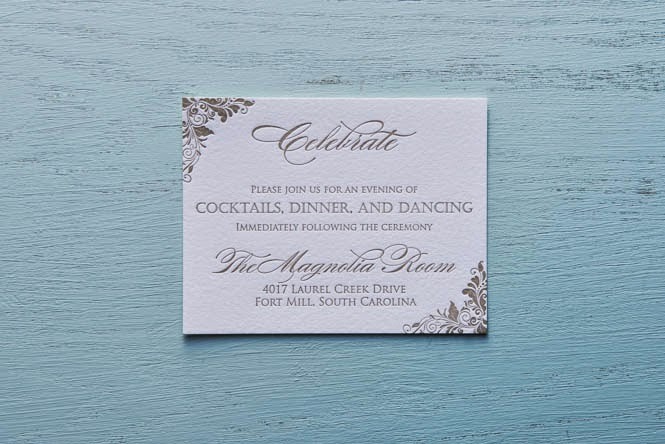 🙂 These were printed in our Pearl White cardstock in the 110#. She wanted to incorporate a New York skyline since the wedding will take place in New York City. She also wanted to include a little heart right above it which I thought was the cutest touch! We used our black ink for the text and I hand mixed the blush color for the skyline on the bottom. 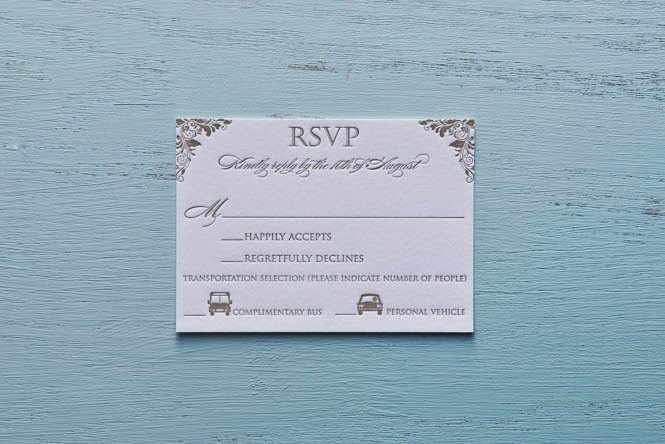 I love how soft and romantic this letterpress card looks. I meant to write you this morning. I got them last night! I love the color of the skyline. Its prefect! Thank you so much! I can’t wait to show you what we come up with for her letterpress invitations! Please be sure to give us a LIKE on Facebook for more updates and photos of our letterpress cards! 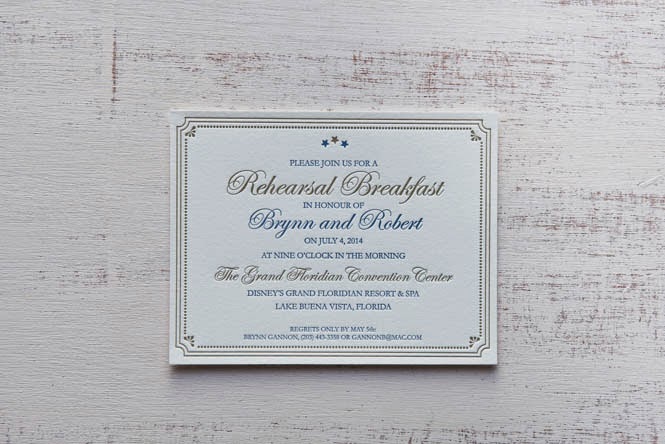 I had the great joy of recently working with Brynn and Robert on their Letterpress Wedding Invitations for their May 2014 wedding. Brynn contacted me in early January and is getting married at the glorious Disney’s Wedding Pavilion in Florida. 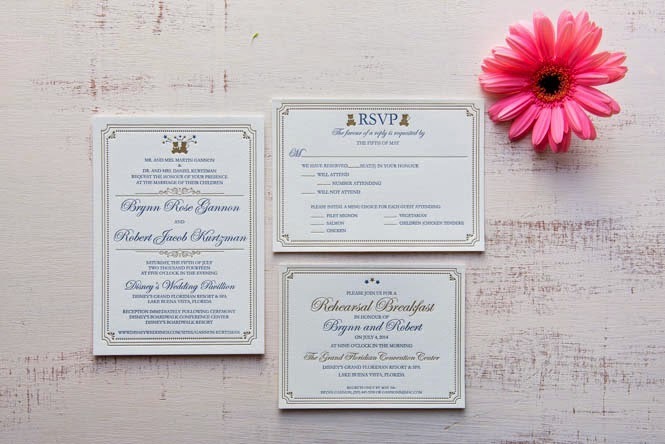 When she initially contacted me, she expressed what she was looking for in her invitation suite. She said, “Overall, we’re looking for a classic design, can be formal, romantic, vintage, Floridian, etc. Our color scheme is light pink, red, white, blue, and gold since our wedding is over Fourth of July weekend. Feel free to play around with the 2-color scheme.” She also mentioned that they liked bears and had a cute cake topper that consisted of two wedding bears. Keeping this in mind, I decided to go for a “vintage Disney” look using a blue and gold color combination, wanting to keep it simple and classic. I also really wanted to incorporate the two bears since it’s just too cute to pass up! 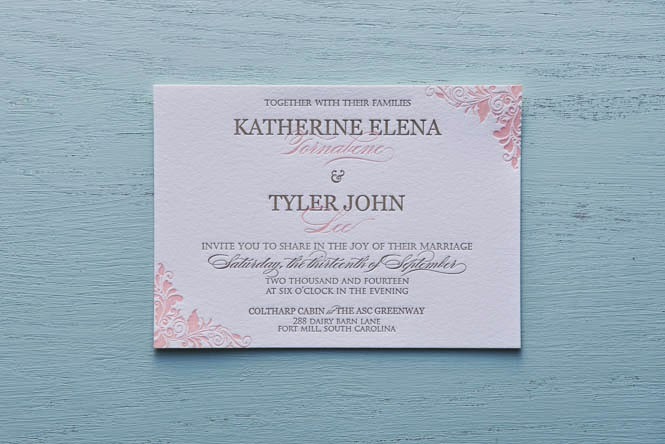 We printed the letterpress cards using our C&P. 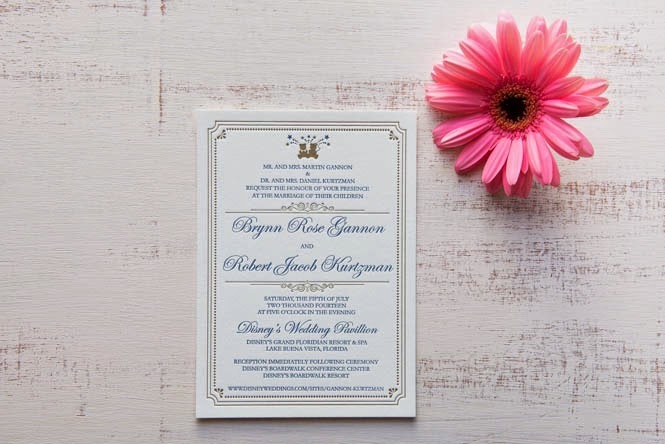 The entire letterpress wedding invitations suite was printed with our Pearl White cardstock, which I feel is a perfect color as it plays into the vintage look we were going for. The Pearl White just gives it a soft, romantic feel and I thought it tied together nicely with the design. The two colors we used were Gold and a blue that I mixed to match Pantone 647U. I absolutely loved the color combination used for this custom design. Apologize for the delayed response, but so happy I can say we’ve finally seen the invites!!! My sister just moved to LA and brought some back out here with her. They are absolutely perfect, and have far exceeded our expectations! We love them and are such fans of your work! You did a great job, we really couldn’t be more pleased with how they turned out! The note you included was also so thoughtful! Hope we have the opportunity to work with you again in the future! Please feel free to checkout out our Facebook page for more updates and photos of our letterpress cards.